Santiago Calatrava and around 16,000 other people crossed the bridge at the official opening. However the bridge is not yet open to traffic. Photographs by Flickr users Marco Becerra and DMHinIrving, licensed through Creative Commons. “The design design upon completion will not only provide a new icon for the Dallas skyline, but will also assist with the city’s economic revitalization. This signature landmark is also the first vehicular bridge that Mr. Calatrava has designed in the United States”. 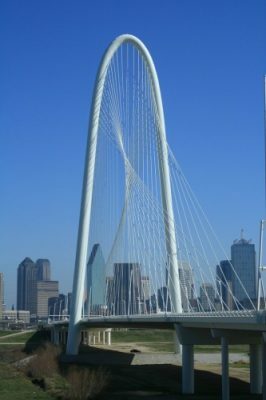 On Friday, September 25th, Santiago Calatrava will attend “Bridging the Trinity,” an event hosted by The Trinity Trust Foundation and honoring the world-renowned architect’s signature Margaret Hunt Hill Bridge in Dallas. The festivities will kick off with a daytime press conference and continue into the evening with a cocktail party celebrating the progress of Calatrava’s bridge, now under construction. Both events will take place on the Continental Bridge, which will become exclusively pedestrian upon the completion of the Margaret Hunt Hill Bridge. The location for “Bridging the Trinity” was chosen for its close proximity to Calatrava’s signature bridge, as well as its nature-inspired backdrop. As an honored guest, Calatrava will be joined by the Mayor of Dallas, Tom Leppert and the Trinity Trust’s National Honorary Chairs, U.S. Senator Kay Bailey Hutchison and Congresswoman Eddie Bernice Johnson. Also expected to attend are the namesake families of the Margaret Hunt Hill Bridge. When first commissioned by the Dallas City Council in January 2002, to design a “signature bridge,” the celebrated architect derived a plan that will not only create a new icon for the city’s skyline, but will also pump life back into the Trinity River. 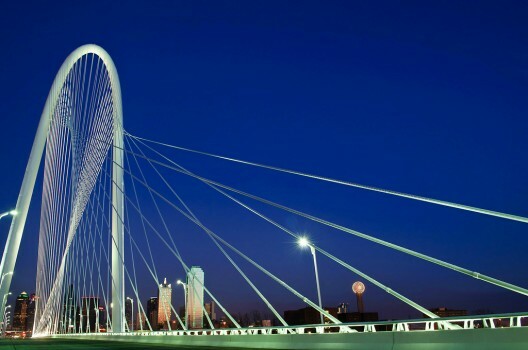 For Calatrava, the Margaret Hunt Hill Bridge is a symbolic gesture; a gateway into the city and the realization of the Trinity River’s enormous capacity to bring a new piece of functional, yet aesthetically stunning development to Dallas. It is also the first vehicular bridge that the celebrated architect has designed in the United States. And as anticipation continues to mount, two of the largest pieces of steel for the Margaret Hunt Hill Bridge have arrived in Dallas. The pieces, which weigh approximately 100,000 pounds each, are part of the distinctive arch feature and centerpiece of the bridge. It is Calatrava’s hope that pieces of the arch could begin being hoisted by the end of the year. Other elements of the bridge include a 1,200-foot long span with miles of cable holding the bridge span in place. In order to transport the massive steel, the pieces are shipped from Italy to Houston, where they are then placed on a truck and driven to Dallas. Santiago Calatrava already has plans for his second Dallas-based bridge, the Margaret McDermott Bridge, which will start construction at a TBD date.